We offer wide range of Waterproofing Chemicals. 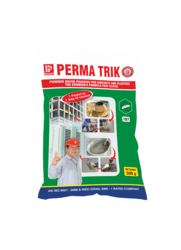 Perma Trik: A special powder with hydrophobic properties which when added to concrete mixes provides for waterproofing and good surface finish. The graded aggregrates in this product helps to minimize the pores in the finished product there by allowing for optimization of the lacquer coating that is Pave Coat.Ideal Dosage of this product shall be 500 gms per 50 kg bag of cement which could be extended to 1 kg. PERMA CONSTRUCTION CHEMICALS introduce Two Component Acrylic Cementitious Waterproof Coatings For Water Tank Waterproofing Application , Waterproof Coating For Terrace Water Proofing & Waterproof Coating For Basement Waterproofing with " PERMA GUARD 2 K"
RCC terrace waterproofing.Sealing leakage through cast iron, asbestos or stoneware pipes.Waterproof Coating on bridge girders and under deck waterproofing of bridges.Sealing cracks in asbestos cement sheets and sealing 'J' bolt openings.Waterproof Coating on leaky plaster surfaces.Podium slab waterproofing.Basement retaining wall waterproofing.To waterproofing water tanks and waterproofing swimming pools. 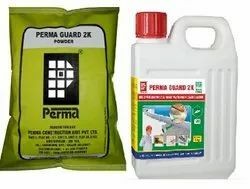 Perma Guard 2 K is a polymer modified cementitious acrylic water proofing system with a very wide scope of applications in water proofing and corrosion inhibition situations. Perma Guard 2 K is a two component material which forms a flexible reinforced membrane upon curing. Perma Eazee Guard Is A Single Component, White Colored Liquid Based On Highly Functional Acrylic Polymers, Which When Applied On To A Surface Forms A Flexible Film Which Waterproofs And Protects The Surface From Rain And Atmospheric Pollution And Aggressive Environmental Conditions. The Eazee Guard Film Allows The Concrete Substrate To Breath Normally And Has Crack Bridging Ability. 1. 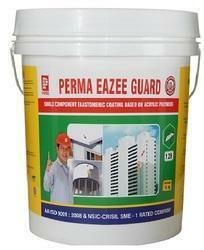 Perma Eazee Guard Is A Ready To Use Product, It Can Be Applied Directly From The Can. 2. The Product Is Water Based Hence No Emission Of Solvents And Is Environment Friendly. 3. Perma Eazee Guard Can Be Applied Seamlessly No Joints Required. 4. The Membrane Allows The Concrete To Breath Hence No Blister Formation And No Delamination. 5. Mechanical Damages To The Film Can Be Repaired Easily Be Recoating. 6. The Product Can Be Applied On A Wet Surface And During Raining Season. 1 New Concrete Must Be Atleast One Month Old Before Carrying Out The Waterproofing Treatment So That Its Curing And Strength Development Phases Are Complete. 2 Clean The Surface To Be Treated To Remove All Dust, Dirt, Laitence And Loose Particles. Repair All Cracks By Widening & Priming Them And Filling Them With Perma Crackfill. Prime The Area To Be Treated With Perma Universal Primer. Stir The Product In The Container Thoroughly Before Opening. Apply Two Coats At An Interval Of 4 To 5 Hours In Between The Coats. At All Junctions And Ridges Reinforce The Membrane With 40 Gsm Pp Or Glass Fabric To An Extent Of 100 Mm On Either Side Of The Junction Or Ridge And Use An Addition Coat Of Eazee Guard. Allow The Coated Surface To Cure Dry In Shaded Condition. We are counted amongst the foremost manufacturers, exporters and suppliers of Water Proofing Chemical, Water Proofing Powder, Water Proofing Liquide & Water Proofing Chemical. 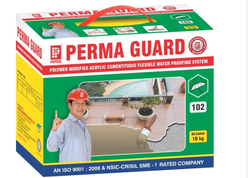 Our Perma Guard is a polymer modified cementations water proofing system with a very wide scope of applications in water proofing and corrosion inhibition situations. Our Guard is a two component material which forms a flexible reinforced membrane upon curing. Can resist up to 10 bar water pressure. Water tank and in swimming pools. 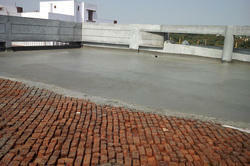 Looking for Terrace Waterproofing Solution ?